A photographic guide for the confusion of names that are frequently used to describe opals. Video of a beautiful Ethiopian Welo opal. 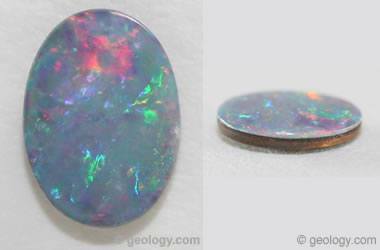 The flashes of color that can be seen as the opal moves are a "play-of-color." The presence of "play-of-color" makes this a "precious opal." YouTube video by ethiopiaopals.com. 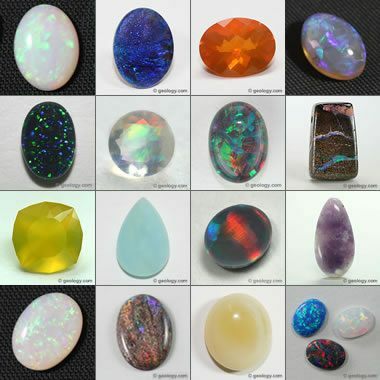 Here are a few of the opals described on this page. Click one to learn more. 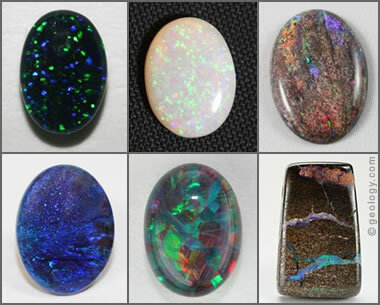 Here are a few of the opals described on this page. Scroll down to learn more. Gem-quality opal is one of the most spectacular gemstones. A single stone can flash every color of the spectrum with an intensity and quality of color that can surpass the "fire" of diamond. The best opals can command prices per carat that rival expensive diamonds, rubies and emeralds. Opal is one of the most popular gems. Opal is a hydrous silicon dioxide (SiO2.nH2O). It is amorphous, without a crystalline structure, and without a definite chemical composition. Therefore it is a "mineraloid" rather than a "mineral." Be Careful! Opals Are Fragile! Opal is a wonderful stone for earrings, pendants, brooches and rings. However, it is softer than most other gemstones. Opal has a hardness of about 5.5 to 6.0 on the Mohs hardness scale. Because of that opal is best suited for use in earrings, brooches and other pieces of jewelry that rarely encounter scuffs and impacts. When used in a ring, the best designs have a bezel that fully protects the stone - instead of being placed in a prong setting that exposes the stone to impact and abrasion. Avoid wearing an opal ring during activities when impact or abrasion might occur. Opal is a very common material that is found throughout the world. Most of this opal is "common opal" or "potch" which has a milky or pearly luster known as "opalescence." 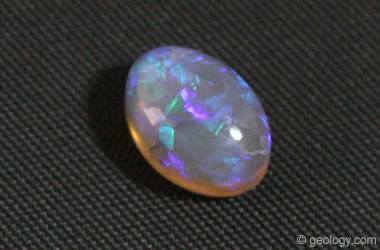 However, rare specimens of opal produce brilliant color flashes when turned in the light. These color flashes are known as a "play-of-color." Opal specimens that exhibit a play-of-color are known as "precious opal." 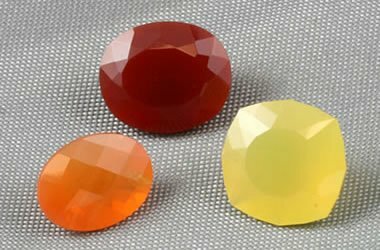 If the play-of-color is of high quality and large enough to cut, the material can be used to produce valuable gemstones. If you examine an opal under bright indoor or outdoor light, play-of-color can be observed in three situations: 1) when the stone is moved, 2) when the light source is moved, or, 3) when the angle of observation is changed. The video on this page (above) illustrates the beautiful "play-of-color" in an Ethiopian Welo opal. 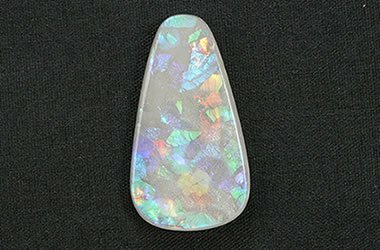 Play-of-Color in Opal: White light enters an opal, interacts with the tiny silica spheres that make up its internal structure, is diffracted into its component colors, and exits the opal in a flash of spectral colors. Areas within an opal that produce a play-of-color are made up of microscopic spheres of silica arranged in an orderly network. This network of spheres acts as a diffraction grating. As the light passes through it is diffracted into the colors of the spectrum. The size of the spheres and their geometric packing determine the color and quality of diffracted light. Although opal is found throughout the world, almost all of that opal is common opal of very little value. Most of the precious opal deposits that have been discovered are in Australia. Historically, mines in Australia have produced at least 90% of the world's precious opal. However, a new challenger has emerged in Ethiopia, where several new deposits of untested size are now producing extremely attractive opals of unique beauty. There are many types of opal, and a wide variety of names are used to communicate about them. 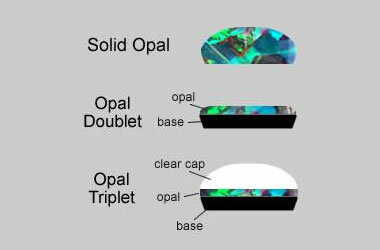 If you have spent a small amount of time looking at opal, you have probably been surprised by this extensive vocabulary of wonderful names. 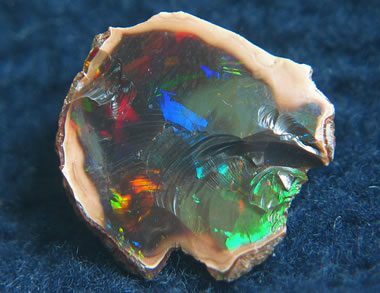 There is actually a logic behind names such as fire opal, black opal, boulder opal, matrix opal, Coober Pedy, Mintabie, Andamooka, precious opal, opal doublet, and opal triplet. The sections of this webpage below will present that logic and help you see the common sense behind the names. And, since pictures are worth a thousand words, we share our favorite opal photos to help you understand. Enjoy! "Precious opal" flashes iridescent colors when it is viewed from different angles, when the stone is moved, or when the light source is moved. This phenomenon is known as a "play-of-color." Precious opal can flash a number of colors such as bright yellow, orange, green, blue, red or purple. Play-of-color is what makes opal a popular gem. The desirability of precious opal is based upon color intensity, diversity, uniformity, pattern and ability to be seen from any angle. Precious opal is very rare and found in a limited number of locations worldwide. Most precious opal to date has been mined in Australia. Ethiopia and Mexico are secondary sources of precious opal. Precious opal is also mined in Brazil, the United States, Canada, Honduras, Indonesia, Zambia, Guatemala, Poland, Peru, and New Zealand. The accompanying image shows several different types of opal that can be called "precious opal." "Common opal" does not exhibit "play-of-color." It is given the name "common" because it is found in many locations throughout the world. Most specimens of common opal are also "common" in appearance and do not attract any commercial attention. However, some specimens of common opal are attractive and colorful. They can be cut into gemstones of beauty that accept a high polish. They can be attractive and desirable - but they simply lack a play-of-color that would earn them the name "precious." Common opal is frequently cut as a gemstone and can command reasonable prices. Shown above is a honey-colored opal from Mexico and teardrop-shaped stone cut from Peruvian blue opal. "Fire Opal" is a term used for colorful, transparent to translucent opal that has a bright fire-like background color of yellow, orange or red. It may or may not exhibit "play-of-color." The color of fire opal can be as vivid as seen in the three stones shown here. Some people are confused when they hear the name "fire opal." 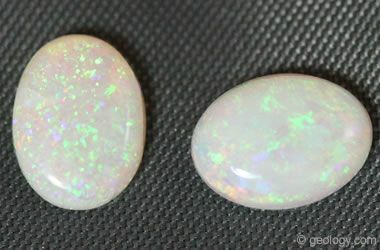 They immediately expect the "play-of-color" found in precious opal. The word "fire" is simply referring to the red, orange, or yellow background color. Fire opal might exhibit play-of-color, but such a display is usually weak or absent. Fire opal is simply a specimen of opal with a wonderful fire-like background color. The color is what defines the stone. "Solid opal" is a name used for a rough or cut stone that consists entirely of opal material without any host rock or other significant inclusions contained within the stone. Solid opal can be a combination of precious opal and common opal. The solid opal on the left is a white opal made from material mined at Coober Pedy, Australia. The black opal on the right was made from material mined at Lightning Ridge, Australia. Solid opal is also known as "Type 1 Opal." "Boulder opal" is a term used for a rough or a cut gemstone that displays opal within its host rock. Opal often forms within the voids and fractures of its host rock, and specimens of boulder opal reveal this aspect of opal's origin. 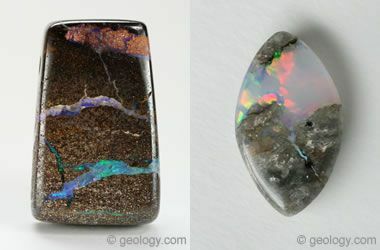 The contrast of color can be striking when a bright flash of opal is seen within dark brown sandstone or black basalt. Many people enjoy the natural appearance of boulder opal and find these gemstones to be beautiful, interesting and educational. The specimen on the left is a boulder opal bead cut from material mined in Australia. It is 10 millimeters by 6 millimeters in size, and weighs about 1.9 carats. It shows numerous fractures in the parent rock that are filled with play-of-color opal. It is a story in a stone. The specimen on the right is a boulder opal from Honduras. It is unusual because the host rock is andesite. It is about 8 x 13 millimeters in size and weighs 2.9 carats. Boulder opal is also known as "Type 2 Opal." "Matrix opal" is a term used for rough or finished gemstones in which precious opal is in an intimate mixture with the parent rock instead of the opal being confined to seams and patches as in boulder opal. 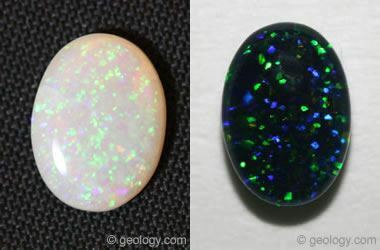 The specimen on the left is a cabochon cut from matrix opal mined at Andamooka, Australia. The precious opal is within the pore spaces of a sedimentary rock. The specimen on the right is a bead cut from matrix opal mined in Honduras. 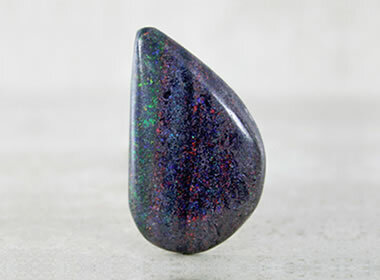 This material is often known as "Honduras Black Opal" because of its black base color. The pinfire appearance is a result of precious opal that formed within the vesicles of basalt. Matrix opal is also known as "Type 3 Opal." 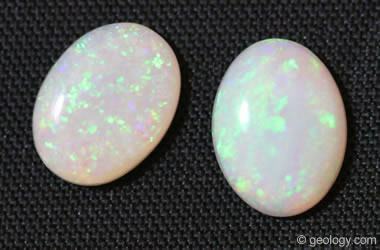 "Light opal" and "white opal" are terms used for opal material that has a white, yellow or cream bodycolor. 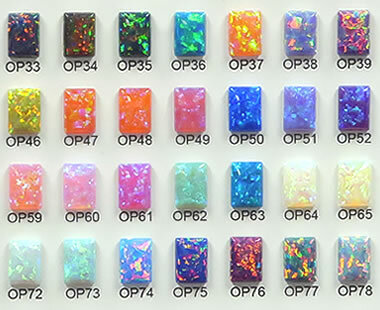 These are the most common bodycolors for precious opal. These stones were cut from material mined at Coober Pedy, South Australia. They are calibrated 8 x 6 millimeter cabochons. "Black opal" is a term used for opal that has a dark bodycolor, often black or dark gray. 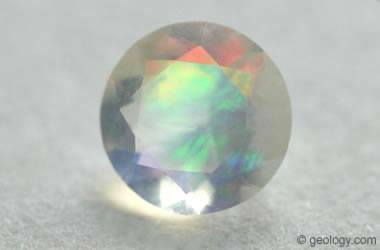 The term is also used for opal that has a dark blue or dark green bodycolor. 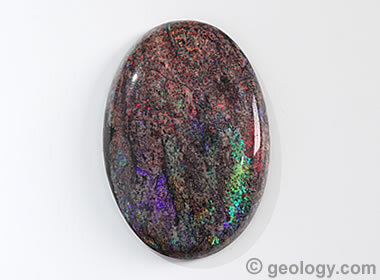 The dark bodycolor often makes the play-of-color in black opal more obvious. This contrast of play-of-color to bodycolor makes black opals very desirable and able to be sold for high prices. 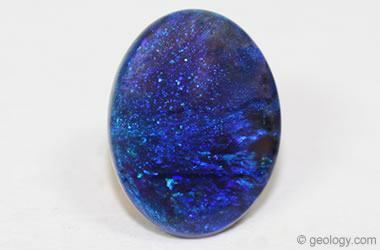 This specimen is a solid black opal with a strong blue face-up play-of-color. It was mined at Lightning Ridge, Australia, the "Black Opal Capital of the World." It is 2.46 carats in weight and 9.5 x 12.5 millimeters in size. "Crystal opal" is a term used for a transparent to translucent opal material that has a play-of-color within the stone. The stone shown here is a semitransparent crystal opal with blue to violet play-of-color. It is a calibrated 8 x 6 millimeter stone cut from material mined at Lightning Ridge, Australia. Shown here is a teardrop-shaped stone cut from "Peruvian blue opal" mined in the country of Peru in South America. Although this stone is common opal that does not have a play-of-color, it is nevertheless very desirable because of its beautiful blue bodycolor. This stone is 13 millimeters by 8 millimeters in size, and weighs 2.3 carats. 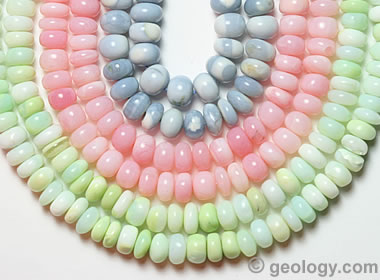 Opal also occurs in shades of pink. 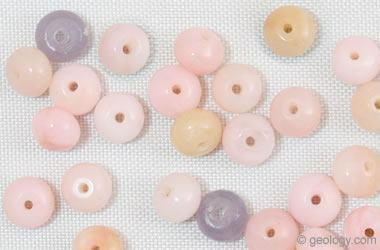 These pink opal beads were made from common opal mined in Peru. They are about four millimeters across and range in color from nearly white, through carnation pink, through lilac. "Morado" is the Spanish word for "purple." Some common opal with a purple bodycolor produced in Mexico has been given the name "Morado Opal." The stones in the accompanying photos are nice examples. 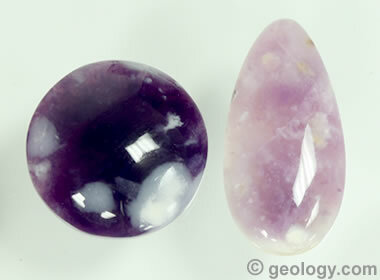 The stone on the left is a 19-millimeter round, and the stone on the right is a 13x26-millimeter teardrop. "Harlequin opal" is a name given to an opal with patches of color in the shape of rectangles or diamonds. The specimen pictured is a harlequin opal from the Constellation Mine in Spencer, Idaho. It is 6 millimeters by 4 millimeters in size. "Contra-Luz" is a name used for a color-play that is visible when the light source is behind the stone. 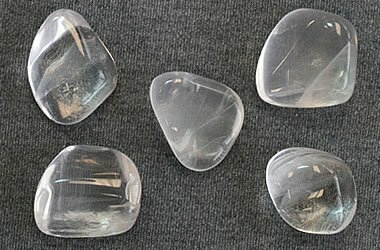 This effect only occurs in stones that are transparent or nearly transparent. "Pinfire opal" is a name used for opal that has pinpoints of color throughout the stone. The opal on the left is a pinfire opal cut from material mined at Coober Pedy, Australia. The stone on the right is a pinfire opal from the Constellation Mine in Spencer, Idaho. It is 6 millimeters by 4 millimeters in size. Rarely, opal will display chatoyancy, the optical effect that produces a "cat's-eye" across the surface of a stone. In these opals, a thin line of bright light is reflected from a parallel network of needle-shaped inclusions within the gem. The line, or the "eye", tracks back and forth across the dome of the stone as the stone is moved, as the light source is moved, or as the head of the observer is moved. Shown here is a cat's-eye opal from Madagascar. Its chatoyancy is produced by hundreds of parallel rutile needles that span the width of the stone and reflect a line of light much like the line of light that is reflected from the surface of a spool of silk thread. Andamooka is one of the early mining districts of South Australia. Commercial production began there in the 1920s. The area is famous for its matrix opal. The stone in the photo is a cabochon cut from Andamooka matrix and weighs about 30 carats. Coober Pedy is a small town in South Australia that was first settled in 1916 when mining for opals began. It was one of the early prolific producing areas and has earned the nickname of "Opal Capital of the World." Coober Pedy is famous for producing white base-color opals, and production has continued uninterrupted since 1916. The stones pictured are white Coober Pedy opals cut to a calibrated size of 8 x 6 millimeters. Gem-quality opal from Ethiopia began entering the market in significant amounts starting in 1994. Since then, additional opal deposits have been discovered that might be large enough in size to take significant market share away from Australia, which has supplied nearly 100% of the opal market for over 100 years. 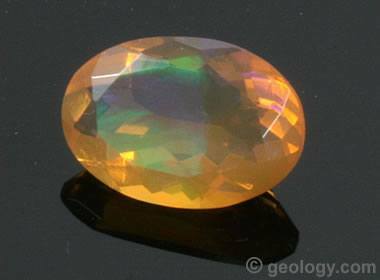 Precious opal, fire opal, and very attractive common opal are all being produced in Ethiopia. They are becoming more abundant in the gem and jewelry market and more popular with consumers. Public domain image by Elade53. Honduras is well known for producing a black, basalt-matrix opal that contains tiny vesicles filled with play-of-color opal. Most people who know opal will understand exactly what you are talking about if you use the term "Honduras Black Opal." 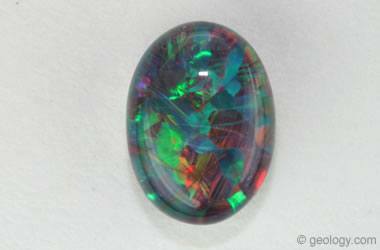 The specimen shown is a bead cut from Honduras Black Opal. Lightning Ridge is a town in New South Wales, Australia that has become world-famous for its deposits of black opal. More black opals have been produced at Lightning Ridge than at any other location in the world. The specimen on the left is a solid black opal with a strong blue face-up color mined at Lightning Ridge. It is 2.46 carats in weight and 9.5 x 12.5 millimeters in size. The specimen on the right is a solid crystal opal with blue to lavender play-of-color cut as an 8 x 6 cabochon. "Louisiana opal" is a quartzite cemented with precious opal that has been mined in Vernon Parish, Louisiana. On close examination you can clearly see quartz grains with the spaces between them filled with a matrix of clear cement that produces a play-of-color in incident light. It is a stable material that can be cut into cabochons, spheres and other objects. 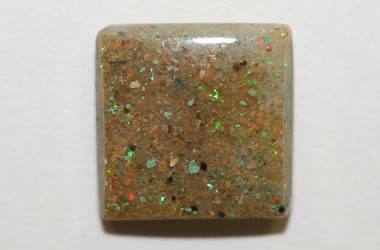 Some of the material is brown like the 20mm x 20mm cabochon pictured, but it also occurs in a gray to black color that makes the play-of-color easier to see. Peru produces some of the world's most beautiful opal. It is not play-of-color opal; instead, it is common opal of uncommon color. Opal mines in Peru yield common opal in pastel colors of blue, green, and pink. The accompanying photo shows strands of rondelle-shaped beads in all three colors. Play-of-color is not needed to have beauty in common opal. The beads in the photo are about seven millimeters in diameter. 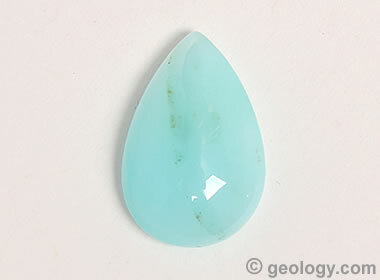 Peruvian opal is also used to make beautiful cabochons and tumbled stones. Most cut opals are solid stones. The entire stone is cut from a single piece of rough (see top illustration). However, some opal rough has very thin but brilliant layers of play-of-color material. Some artisans cut the stone down to the thin color layer and glue it to a base of obsidian, potch, basalt, or plastic - then cut a finished stone. 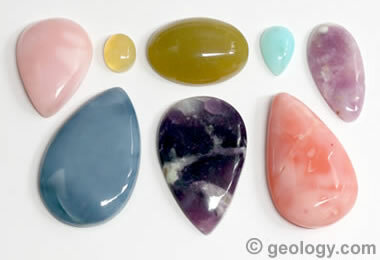 These two-part stones are called "opal doublets" (see center illustration). To protect the fragile opal from abrasion and impact, some artisans glue a transparent cap of quartz, spinel or other transparent material onto the opal. This produces a three-part stone, called an "opal triplet" (see in the bottom illustration). The two pictures shown here are of the same stone. The picture on the left shows the face-up appearance of the stone. The picture on the right is a side view. This stone is an opal doublet that was assembled from a thin layer of precious opal glued to a backing of host rock. In the side view you can clearly see the "glue line" between the two materials. If this stone was mounted in a setting with a cup bezel, it might be impossible to tell if it was a solid opal or a doublet. 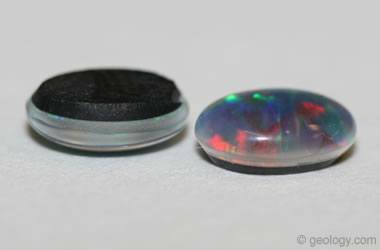 The two stones pictured are opal triplets produced by sandwiching a thin layer of precious opal between a backing of black obsidian and a cover made of clear synthetic spinel. The clear top acts like a magnifying lens and enhances the appearance of the thin precious layer. The black obsidian back provides a contrasting background that makes the play-of-color in the precious layer more obvious. If you look very closely at the inverted stone, you will see a tiny line of color that is the edge of a thin slice of precious opal. Because of opal's beauty and desirability, people have been producing materials that look like opal for nearly a century. A person with a little experience can easily recognize most of the "look-alikes." "Natural opal" is the name used for genuine opal that has been mined from the Earth. It is genuine opal made by nature and not by humans. The specimen here is a black opal mined at Lightning Ridge, Australia. "Synthetic opal" or "lab-created opal" or "lab-grown opal" are some of the names used for opal that has been made by humans. These opals are made from materials that have the same chemical composition (hydrated silicon dioxide) as natural opal. They can have spectacular play-of-color and a beauty that rivals some of the best natural opals. Synthetic opal has been made since the 1930s. An untrained person might not realize that this opal is synthetic, but trained gemologists can usually tell synthetic opal from natural opal by examination with a loupe or microscope and sometimes with their unaided eyes. 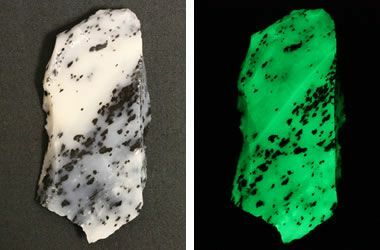 However, some synthetic opals are so convincing that trained gemologists must send suspect specimens to a laboratory for positive identification. "Imitation opals" are often made from plastic or a glassy material that is not silicon dioxide, and their play-of color is not produced by light passing through an array of tiny spheres. They sometimes called "opalite" when sold in stores. 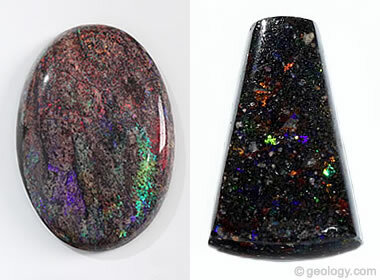 These materials can have a very attractive appearance that looks very similar to opal. They are legitimate products if they are not advertised or sold in ways that inexperienced buyers will assume that they are buying natural opal. "Mookaite" is the trade name for an opaque gem material with spectacular color patterns that is mined in Western Australia. Gemological testing identifies most mookaite as a chalcedony. 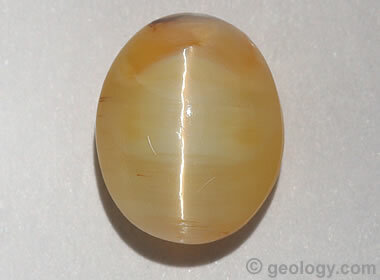 However, some mookaite has the refractive index and specific gravity of opal. 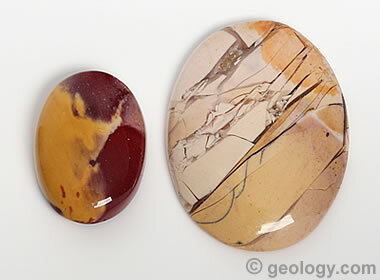 The cabochon on the left has the familiar color pattern of mookaite. 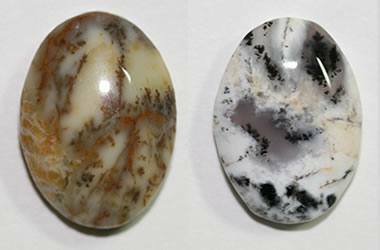 The cabochon on the right has the less-familiar brecciated appearance. 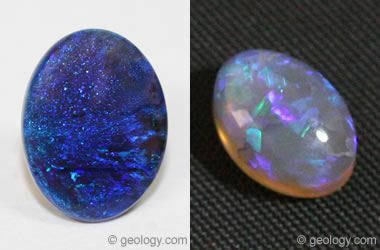 Both can be properly called "common opal". 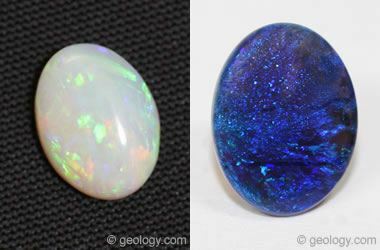 Most opal will glow or fluoresce weakly under an ultraviolet lamp. However, some specimens exhibit a spectacular fluorescence. This specimen of mossy common opal rough from Virgin Valley, Nevada fluoresces a brilliant green under UV light. The photo on the left was taken under normal light, and the photo on the right was taken under a short-wave ultraviolet lamp. Opalite is a name given to an impure variety of common opal that can contain plumes, moss or other inclusions. The name "opalite" can be confused with plastic or glassy materials - imitation opals - that are sold under the same name. Some opal does not exhibit a "play-of-color," does not have a base color, and does not have a bodycolor like most common opals. But this material is still opal. The tumbled opals pictured are examples of this material. It has been called "water opal" and "hyalite." 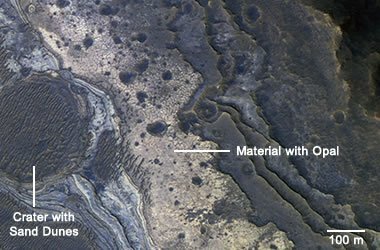 In 2008, NASA's Mars Reconnaissance Orbiter has discovered a number of opal deposits on Mars. In this satellite image, the ground the surface in the pinkish cream-colored area to the right of the impact crater is covered with hydrated silica rock debris that we would call "opal." Mars researchers have also identified layers of opal exposed in the outcrops of crater walls. Since opal is a hydrated silicate its formation requires water. So, the discovery of opal on Mars is another evidence that water once existed on the planet. Image by NASA.